Paul Craig Roberts article, first published by GR on May 2, 2011 coinciding with the “official” announcement of the death of Osama bin Laden. 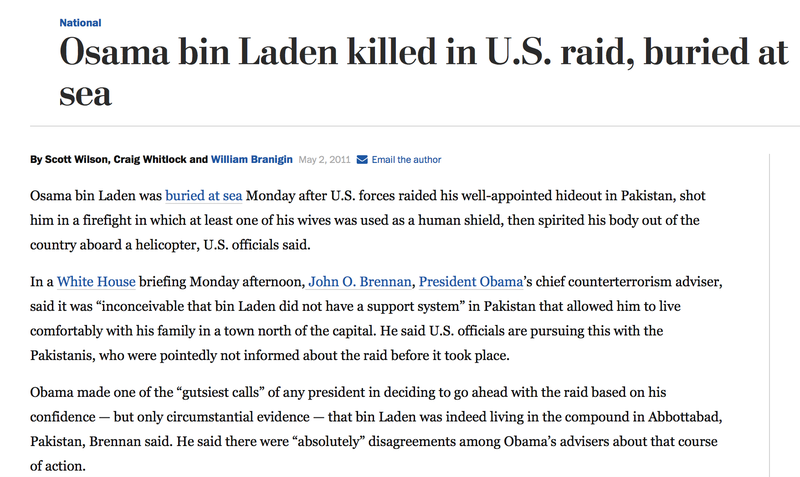 If today were April 1 and not May 2, we could dismiss as an April fool’s joke this morning’s headline (see below) that Osama bin Laden was killed in a firefight in Pakistan and quickly buried at sea. As it is, we must take it as more evidence that the US government has unlimited belief in the gullibility of Americans. No doubt President Obama is in desperate need of a victory. He committed the fool’s error or restarting the war in Afghanistan, and now after a decade of fighting the US faces stalemate, if not defeat. The wars of the Bush/Obama regimes have bankrupted the US, leaving huge deficits and a declining dollar in their wake. And re-election time is approaching.